If your business wants to cut operational costs and keep your vehicles producing, fleet management will do just that. Any time of the night or day, Berico’s service representatives will fuel the tanks of your vehicle fleet when it is convenient for you. With prompt and efficient service, fleet fueling in Greensboro affords you a higher yield on productivity by keeping your workforce on the job, not at the pump. No matter if your business uses company vehicles or construction machines, leave your fueling worries behind by scheduling fleet fueling with Berico today. Reduces the amount of idle time for your workers. Vehicles are fueled up and ready to go at the start of the business day. Offers competitive prices with predictable fuel costs. No more inconsistency from one fueling to the next. Consistent premium quality fuel. Berico supplies the best fuel for your money. Reduces paperwork by buying fuel from a single supplier. No more keeping track of receipts or invoices from multiple companies or fueling stations. Provides you with daily usage and offers weekly reports. These reports make it easy to monitor your fuel usage. On-time delivery 7 days a week – 24 hours a day. Temporary skid tanks provided (For construction sites). On-site fuel is convenient. No need for expensive tanks on your yard. No hassle with environmental regulations. Your drivers are ready to go when they start their shifts. Drivers are capable of higher productivity with more pickup and delivery time. Out of all the benefits of fleet fuel service, most of them come down to saving your business time and money. Having fuel delivered to your fleet means drivers don’t have to waste time filling up at gas stations. Prices are more consistent so you avoid the up and down yo-yo of gas prices as local stations compete with each other. You save time by no longer having to try and keep track of each individual vehicle’s fill ups. Buying fuel in bulk means lower prices and easy tracking of fuel usage. Berico even offers weekly reports of deliveries for your records and to help you better manage fuel usage. That’s just one way that Berico goes above and beyond the competition. When it comes to fleet management, you need a reliable company that understands the importance of prompt service. 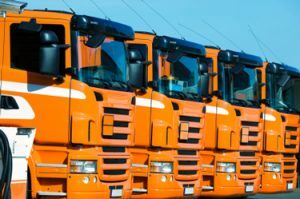 You need to know that you can count on your fuel supplier to provide your vehicles with the fuel they need when they need it. Berico has been serving Greensboro, Burlington, Eden, and the surrounding area since 1924. We have generations of satisfied customers who rely on us for all of their fueling needs. Berico understands the importance of fuel supply for your business and we always provide quality fuel at fair prices. To get started with convenient fleet fuel management from Berico, call (336) 273-8663 or sign up for deliveries here. We look forward to serving you.